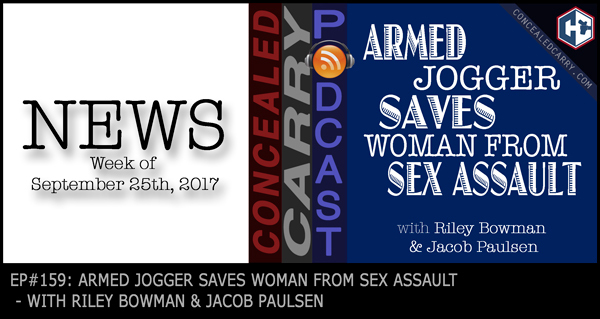 Crazy stories this week as Riley and Jacob cover the news and JUSTIFIED stories of the day. Especially do not miss the story where one armed jogger, a man, stopped a terrible sexual assault on a woman along a popular jogging trail. Also stories about the hero that stopped a Tennessee church shooting, constitutional carry possibly coming in Wisconsin, and gun sales are on the rise once again after taking a nose dive during the “Trump slump.” Hit the ‘PLAY' button and listen in now!! Guardian Nation. We’ve made it really easy to join Guardian Nation right now. Until the end of September 2017 join at either the Quarterly or Annual level and receive an $80 custom holster for free. You will also qualify for the Gear Box shipping on November 15th and will get access to our member only Black Friday Sale in addition to all our standard membership benefits including the live broadcasts and training video library. Join today at GuardianNation.com and you will also be in time to join us live with James Yeager later this week! Urban Carry. Jacob & I attended a recent media event where Urban Carry announced the upcoming release of a new holster system called “The Revo.” The Revo is a modular system of gun “shells and rigs” making it easy to carry any gun in any traditional holster position at any cant you wish without buying endless numbers of holsters. The official launch will be October 19th but watch for an upcoming review of this new product line! Great listen! You guys should do a story about your views on lights/lasers. I’m curious to know your opinions. Your podcast is amazing by the way I listen all the time! Thanks for listening!! We have discussed more than a few times about doing a lights/lasers themed show. I’ll have to see if we can get that worked into the lineup soon. Great suggestion! We’ve talked about doing that for some time. We’ll try to get to that sometime soon! Did you say something on the show about people needing a year of training before they carry? What kind of training do you suggest people get? I grew up around guns, and have owned and shot my own for a very long time. I’d love to hear your suggestions. Joshua we definitely did NOT say that someone needs any period or time of training before they carry. We strongly feel that with some minimal safety training you are probably better off with the gun than without. Despite that we do strongly encourage people to engage in an immediate and lifelong journey of getting more training and knowledge. What kind of training? More is always better but here is a suggestion: Start with basic and check your local gun range/club. Find something affordable and give it a shot. You will quickly get a sense for your skills and from there can decide what your next move should be. I will address this question in an upcoming episode.